Decades ago, a "flashlight on the handlebars" was a popular type of bicycle light, and the flashlight holder made by Wald (see below) would hold a cheap 2 D cell flashlight that was only marginally effective at lighting the road. Ironically, with the advent of high-power LED flashlights, a "flashlight on the handlebars" is now an excellent and relatively inexpensive bicycle light. While a 3W Cree LED bicycle light will sell for well over $100, a 3W Cree LED flashlight sells for as little as $30. There are a variety of methods of mounting a flashlight to the handlebars. The flashlight mounts are almost always far more sturdy than the flimsy plastic clamps used on commercial bicycle lights. The two most popular flashlights for use on bicycles are the Fenix L2DCE and the Task Force FT-NS-2C-3W (sold only at Lowe's). Both use a 3 watt Cree LED (be careful as both of these models used to use a 3 watt Luxeon LED and there are still many of the older ones in the supply chain. Lowe's stores may have either the older Luxeon model, the newer Cree model, or both, and the SKU and UPC code are the same (but the packaging is different). If you've got only $35 to spend on a headlight, you could not do better than the Cree version of the Lowe's Task Force FT-NS-2C-3W, and a homemade bracket as described below. In fact, this type of light is far better than many $150 bicycle lights, especially the German dynamo powered lights. Flashlights can be an alternative to a dedicated bicycle light. The adjustable beam pattern (spot to flood) is particularly useful for bicycling, though the newer Cree LED flashlights are so powerful that the spot beams have sufficient spill to illuminate the periphery. I would not advise going any larger than a three C or two D cell flashlight because you don't want a lot of extra weight on your handlebars. Note that there is a problem with many flashlight holders where the flashlight is always perpendicular to the handlebars. Many handlebars are curved or angled back from the stem, so if the flashlight is perpendicular to the bars then it isn't pointing straight ahead. Three designs that I made, and one commercial product, solve this problem. I got fed up with all the poorly designed flashlight holders and decided to design, manufacture, and sell my own product. Actually the new Fenix mount looks like another good product, but it's rather expensive at $12.95. 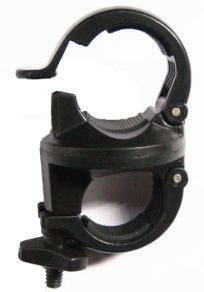 Adjustable rotation of center clamp for use on curved or angled handlebar holders. Most other flashlight holders always have the flashlight perpendicular to the handlebars, but in many cases handlebars are angled or curved so the light doesn't shine straight ahead. Made of stainless steel, aluminum, and rubber with nothing to rust. Removes from bicycle in seconds so you can take your light with you to avoid theft. Much more durable mount than the easily broken flimsy plastic mounts used most bicycle lights. Usable on flashlights with barrel diameters from 1/2" to 1"
Usable on handlebars and tubing up from 1/2" to 1"
No protruding fasteners, doesn't look like a kludge. I'm just getting started, so I don't know the labor going into each unit, but the single unit price will be $7. 10% off for 5-9, 20% off for 10 and up. The prototypes were polished aluminum, but black is a possibility as well. Of course these are made in the U.S.A.! If you're interested in buying some, e-mail me at scharf.steven@nordicbicycleproducts.com. Shipping will be around $6, regardless of quantity. I toyed with the idea of C cell version, but the larger rubber clamps are really huge and much more expensive. I may make some using the Nite Ize C size Delrin clamps, but since these clamps are more expensive than the rubber clamps, the cost would be around $12. The top clamps (for the flashlight) are fixed in position with machine screws and industrial adhesive. The bottom clamp can be rotated by loosening the machine screw. It's suggested to use some thread lock on the screw once you find the proper position. I built this flashlight holder out of a pair of Nite Ize Lite AA size ClampsTM, a Giant handlebar bottle clamp, and a piece of 1/8" thick, 0.75" wide, aluminum flat bar. A cleaner design would use 3/16" flat bar, and have tapped holes for the flashlight clamps, rather than use nuts, and use some thread lock compound. The Giant clamps are available from Giant dealers for $5. If you build something like this, be sure to tailor it for the specific flashlight you'll be using, by spacing the Nite Ize clamps in the proper position and cutting the aluminum flat to the proper length. You can't see it from the picture, but the holes for the cage clamp were drilled extra large, and some small fender washers were used to prevent the bolt heads from going through the holes. This allows the aluminum flat bar to be angled slightly on the clamp to compensate for mounting the clamp on a section of handlebar that is angled or curved. An advantage of this device is that the flashlight does not have to be perpendicular to the handlebars, so it can be used with handlebars that are curved or angled, enabling the light will to be properly aimed. I built this flashlight holder for the Lowe's 2C Taskforce 3W Cree LED flashlight out of a pair of Nite Ize Lite C size ClampsTM, a rail clamp (with heat shrinkable tubing), and a piece of 1/8" thick,0.75" wide, aluminum flat bar. The aluminum bar can be rotated to aim the flashlight properly. This is a very secure mount because the rod clamp is wide and provides a lot of grip surface on the handlebars. It's especially good for heavier flashlights (2C and up). A cleaner design would use 3/16" flat bar, and have tapped holes, rather than use nuts. The rail clamps are available from Cabela's for $6. An advantage of this device is that the flashlight does not have to be perpendicular to the handlebars, so it can be used with handlebars that are curved or angled, enabling the light will to be properly aimed. This is a funky homemade bracket made from two conduit hanger clamps. I designed it for the $30 Lowe's Cree 3W flashlight. Made of solid steel, it's not going to break like funky plastic mounts. It solidly grips the flashlight barrel. It's easily moved from bike to bike, but it's cheap enough that you can build one for every bike you own. 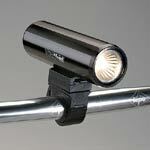 A more elegant MagLite mount is available from dkg bicycle products. Available for AA and C size flashlights, for 1" handlebars. Shims are available for 7/8" handlebars. $19, $25. and $4 respectively. Only fits MagLite flashlights. A disadvantage of this device is that the flashlight is always perpendicular to the handlebars, and the handlebars are often curved or angled, so the light will not be able to be properly aimed. 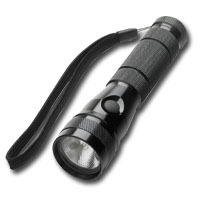 Wald D cell Flashlight Holder (do not use greater than a 2 D flashlight). This is a classic. 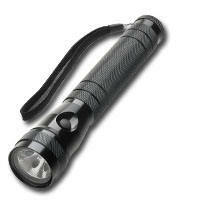 However D cell flashlights are a bit large to use on a bicycle, and most high power LED flashlights use AA or C cells. Flashlight in a TwoFish Cyclopblock. Don't go more than a 3 C flashlight. About $8. Note that there are different types of these blocks. The ones that are 3 for $12.50 or $5.95 each (from Boomer)are lighter duty than the ones that sell for $9.95 each. 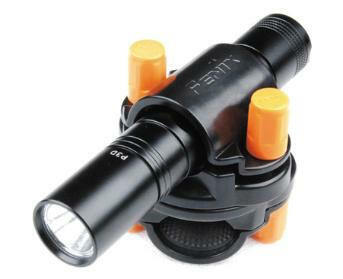 Use the heavier duty Cycloblock for 2 C or 3 C cell flashlights, or 3 AA cell flashlights, but the lower cost LockBlock is fine for 2 AA cell flashlights. Nite Ize Lite Ride. Holds an AA Maglight. Looks kind of funky to me. It appears as if you can aim the flashlight, even on curved or angled bars, but whether or not it remains aimed is another question. Japanese Cycle Commuter using a Maglight type flashlight on her bicycle. She appears to be using a different type of mount, probably a Japanese product. I've seen a lot of cool Japanese bicycle accessories while in Japan, items that are not sold in the U.S..
Another quality product from Fenix. The 360 bike mount molded from German Bayer PVC Plastic is extremely rugged and durable with anti-aging and UV resistant elements. This enables the mount to withstand extended exposure to sunlight and weather elements. 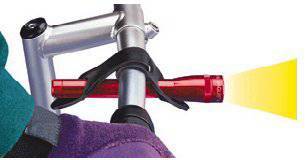 Adjustable grip accommodates various handlebar and flashlight sizes(18-26mm). Custom rubber matting shock and slip resistance. Anti-aging elements were added to rubber compound for extended service. Beautiful symmetrical design yet practical and versatile." Be sure to measure the barrel of your flashlight with a caliper prior to purchasing this. "Turn your favorite Flashlight into a Bike Light in seconds, without the need to use any tools. The holder also swivels in 360 degrees. This works for all flashlight with body diameter for 7/8" to 1-1/8" or 23 to 27 mm." It cannot be used without a spacer on most AA metal barrel flashlights. I've seen some complaints that this mount is not durable. After buying the Lowe's Task Force 3 Watt LED Flashlight (four of them) I needed a secure method to mount it to the handlebars. Not wanting to buy four TwoFish Cyclopblocks, I decided to build my own inexpensive brackets from electrical conduit clamps. I covered the sides of the two conduit brackets with heat shrink tubing, then tightly bolted them together with a pan head bolt and lock nut (this enables the flashlight to swivel in order to aim it straight ahead when it's mounted to handlebars that are angled). The heat shrink tubing provides friction to hold the flashlight in place and to hold the handlebar clamp in place, as well as protecting the finish of the bars (and if used on a metal flashlight, the finish of the flashlight). Note that the 1 1/4" conduit hanger is just the right size to hold the Task Force flashlight when the sides of the clamp are covered with heat shrink tubing, but without the tubing it will be too loose (you may want to use two layers of heat shrink tubing if it's too loose even when the clamp is tightened completely). You can buy conduit hanger clamps at a hardware store. The bolts that hold the clamps closed could be trimmed with the cut-off wheel of a Dremel tool to create a more finished appearance, and you could use an acorn nut with Loctite for the handlebar clamp, rather than a lock nut. There are also acorn lock nuts available but these are not found at a hardware store, they must be special ordered from an industrial supply house. The wing nut on the flashlight clamp allows for tool-free removal of the flashlight. Do not cover the bolt hole with heat shrink tubing, I tried this in rev 1.0, and it required an extra washer for the nut to not wreck the heat shrink tubing when tightening the nut. Rev 1.1 left the bolt hole uncovered which was less work, required less heat shrink tubing, and eliminated the need for washers. I also made a similar bracket for the Fenix L2DCE. Just use a ½" clamp for the Fenix versus a 1¼" clamp for the Task Force. The bill of materials for this bracket is listed below. I could have built them for slightly less had I bought all the nuts and bolts from my local surplus electronics supplier HSC (Halted Specialties Company), but some of the parts came from Home Depot and Orchard Supply Hardware. I had the heat shrink tubing in stock, and I don't know how much the 12" worth of tubing would cost, probably about $1, though you'd need to buy more than what you need for just this project. The cost per unit ends up to be around $3. One advantage of the relatively long length of the brackets is that when you mount the light under the handlebars it lowers the light by an inch or two below the bars which reduces the shadows on the road. I probably would not use this bracket to mount the light above the handlebars as it would add too much height. Another advantage is that his mechanism allows the flashlight to be properly aimed even if the handlebars are angled, something that isn't the case with a TwoFish Lock Block. Conduit clamps are available in many different sizes, so if you're using a different flashlight you can probably find suitably sized clamps. The McMaster-Carr catalog on page 1442 shows a variety of sizes of these clamps. They are also available in stainless steel at a higher price. Be careful as each company that sells these clamps seems to have a different way of specifying the diameter. Buy the one without bolts, then buy a pack of 3/4" bolts, which eliminates the need to trim the 1¼" long bolts that come with the clamps. You can also buy conduit clamps that are threaded to eliminate the need for a nut, but this also eliminates the ability to use a wing nut (you can use an eyebolt and a washer instead). I think that this design is less of a kludge than using two hose clamps with rubber spacers, and it has the advantage of the swivel. Most mountain bicycle bars are angled, and it is important to be able to properly aim the light. 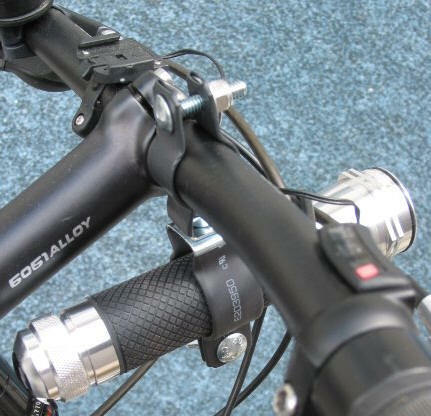 In fact the handlebar mounts for most commercial bicycle lights have a design flaw as they cannot be aimed properly when on angled handlebars, and the same is true for the TwoFish blocks for flashlights. If you don't have a heat gun, Harbor Freight usually has these on sale for $10, and they also sell heat shrink tubing at a good price. I find many bicycle-related uses for heat shrink tubing, it's so much nicer than funky electrical tape. For instance on brake and derailleur cables that won't take solder, a short piece tubing over the end prevents unraveling of the cable. When swiveling the two clamps, turn the clamp with the screw in the clockwise direction in order to not loosen the lock nut. You may want to use some thread-lock compound on the lock nut. I've had one bicycle where it became loose over time. A flashlight that will be used on the handlebars with a TwoFish Cyclop Block should have certain characteristics. Cannot be too large. 8" is about the maximum, and 6" would be better. Cannot be too heavy. Don't go more than about 1 pound; 8 ounces would be better. Adjustable focus. A spot to flood capability is very useful, but most of the LED flashlights lack this capability. Battery type. There are trade-offs of price, weight, size, and capacity, as well as the ability to use commonly available non-rechargeable batteries in place of rechargeable cells in a pinch. Lithium-Ion rechargeables offer the greatest capacity, smallest size, and lightest weight, but are the most expensive and you can't stick in some AA or C cells in a pinch. Lithium non-rechargeables are similar, but are of course not-rechargeable, and not a good choice for frequent use. AA or C cells are good because you can use either NiMH rechargeables, or standard alkalines, but you will be carrying around more weight and volume of battery for the same level of capacity. Task Force 3 Watt LED Flashlight from Lowe's, Model FT-NS-2C-3W Item # 225285, SKU 6937481300067, 150 Lumens. 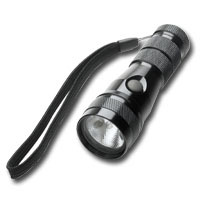 This is the best priced 2C Cree LED flashlight on the market, selling for $30 at the Lowe's chain of hardware stores. Be very careful as there are two flashlights from Lowe's with the same model, item, and SKU number. One of them does not have the packaging shown below. You do not want the model that says "Luxeon" on the packaging, and that lacks the "60X Brighter" statement on the packaging. Many Lowe's stores have only the Luxeon version, some Lowe's stores have both. Do not order this online from Lowe's or you will likely get the Luxeon version. Do not send someone to the store to buy this that does not understand what to look for on the packaging. Supposedly Advance Auto Parts stores AAP3W is the same flashlight, maybe not (it may use the Luxeon emitter). 150 lumens. Some people have modified it by replacing the X5-E emitter with at CREE Q5 bin emitter, and getting 200-240 lumens. This beam is so bright that there is sufficient spill for peripheral illumination, but it is in fact a spot beam not a flood beam. You don't really have the problem of most dynamo lights of insufficient peripheral illumination because of the amount of spill. It's interesting to note that the spill of a spot beam is actually a positive for bicycle lights because without sufficient spill you are not able to illuminate off to the sides or up to road signs. This is a low cost alternative to the DiNotte and is actually brighter than the Luxeon 3W DiNotte. Again, be sure to get the Cree version, not the Luxeon version. This flashlight is too large for the holder from EliteLED. 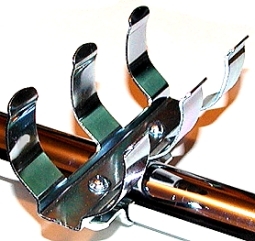 Use the Cycle Block from TwoFish, found at http://www.boomerdirect.shoppingcartsplus.com/catalog/item/1719053/1226129.htm. The batteries tend to rattle inside as the interior diameter is a bit too big for a snug fit of the batteries. A small sheet of paper can be rolled around the batteries to eliminate this problem. There is only a single brightness. With the Fenix there are lower brightness modes that reduce battery consumption when full brightness is unnecessary. To use AA NiMH cells with C size adapters requires that you slightly modify the + contact inside the flashlight as it does not properly contact the + contact of an AA cell battery. Actually I found the same issue with Tenergy C cells. Unlike an alkaline battery, where the there is a large surface area for the + contact which includes the button, the NiMH cells have only the actual button as a contact. If you don't modify the spring contact at the + end, the contact will be intermittent. I cut the end off of a steel hollow wall anchor, leaving a couple of millimeters of the shaft, and inserted that into the spring contact. Don't use a penny or a washer, as you need for the contact to stay in place in the center of the spring. There is apparently no DC-DC converter. With NiMH batteries this isn't a big problem because the voltage stays pretty constant, but with alkalines, the voltage drops off as the batteries become depleted. 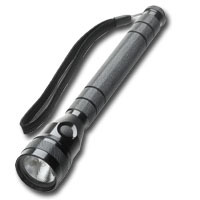 APF708 3 Watt LED Flashlight from Advance Auto Parts, Kragen, and Checker Auto Parts Stores. This is very similar to the Lowe's Task Force flashlight. The image shown is the Luxeon version, but there have been reports of a Cree version being sold in stores. A bargain at $20. Available on-line, click here, but no way to know if you'll get the Cree or Luxeon version. 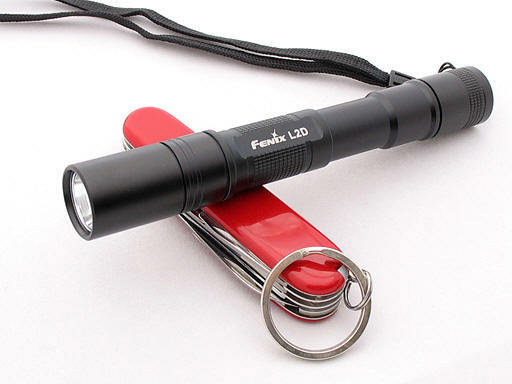 See http://www.eliteled.com/products/flashlights/fenix-l2d-ce.html. This is the ultimate in an LED flashlight for use on a bicycle. Excellent beam, small size, uses AA batteries internally. I suggest using Sanyo eneloop AA batteries if you only use the light occasionally, as these cells have low self-discharge. Note the Swiss Army Knife for a size comparison, as this light is very small. $53.50. This is a low cost alternative to the DiNotte and is actually brighter than the Luxeon 3W DiNotte. Be sure to get the CE (Cree Edition) version, not the Luxeon version. The body says L2D, but the package should say L2DCE. DC/DC regulated circuitry provides maximum light output throughout the life of the battery. This flashlight is sold at Wal-Mart stores (not online) for about $25. There is a 1 watt version for around $19. Available online at http://www.flashlightz.com/product.php/rayovac/selux2aa3w-b/?product=171725. Now that the Cree LED Coleman models are available at Wal-Mart, this model is less attractive. 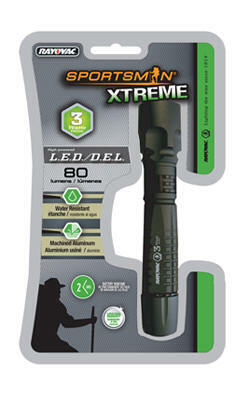 Smarty-Mart (Wal-Mart) has four new Coleman Max flashlights with Cree XR-E emitters. One uses 2AA batteries, two use 3AAA batteries, one uses 2 CR2 batteries. All claim 115 lumens. Ironically, the 3AAA model has a longer run-time listed than the 2AA model, even though an AA alkaline battery has a capacity of about 3000 mAH (2 x 3000mAH * 1.5V = 9WH), and an AAA alkaline battery has a capacity of about 1200 mAH (3 x 1200 MAH * 1.5V = 5.4WH). 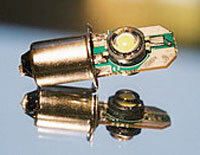 This may be to the inherent characteristics of the Cree LED, as well as the high current draw. The Cree LED operates more efficiently at the higher voltage (4.5V versus 3V), and the high current draw on alkaline batteries greatly reduces capacity of the battery. It'd be interesting to do a test of each model with NiMH and alkaline batteries. The 3AAA models have a larger diameter body and reflector. There may be a 3AA model as well. There was a shelf tag for something labled "3A" but no product. The flashlights were all mixed up, hanging in the wrong places, and were in multiple locations. Whatever you think of Wal-Mart, they at least seem to have a knowledgeable buyer of flashlights, and are able to get manufacturers to do products solely for sale at their stores. The tri-color model has a low-power blue LED and a low-power red LED in the reflector. The Streamlight Strion is the best flashlight for handlebar mounting, if size, weight, brightness, and beam are your primary considerations (as opposed to cost). It uses rechargeable lithium-ion batteries, and has an adjustable spot-flood lens. It weighs less than six ounces, and is 5.3 inches long. 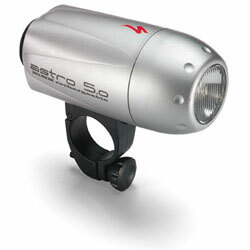 It uses a 6 watt xenon bulb and is rated at 80 lumens (more than twice as powerful as a 2.4W dynamo powered headlight. Run time is about 70 minutes per charge, which makes it suitable for moderate commutes. Alas, it is also quite expensive. You're looking at $100 by the time you get the flashlight, charger, and some spare bulbs. See: http://store.yahoo.com/swps/streamlight-strion-rechargeable.html. Mine runs 85 minutes with a new battery, and charges in 2.8 hours. This light is popular with law enforcement and with survivalists. Slimmer and lighter than the 3C, this hybrid xenon/LED flashlight puts out 46 lumens from a xenon bulb. The focus is adjustable, but only slightly. About $20 on sale (Fry's). This light is better than the 2AA Mag-Lite. Mag-Lites have a better spot to flood focusing range than the Streamlight xenon/LED hybrids. A 2C or 3C Mag-Lite would make a good bicycle light. The 2AA is not powerful enough. Get the upgrade from the standard Krypton bulb to the more powerful Xenon bulb. 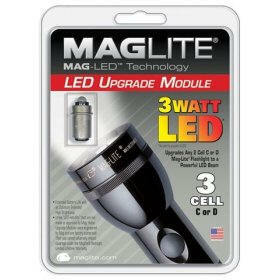 See the specifications at: http://maglite.com/lampspecs_ccell.asp. These cost around $20. 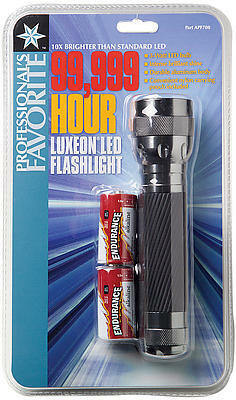 These are good flashlights to use with the Luxeon PR3 bulb replacements. MagLite also now markets AA and D cell flashlights that have a 3 watt Luxeon bulb. The adjustable beam pattern (spot to flood) of a Maglight is very nice, but it is impractical to mount a big 5 D cell Maglight on your handlebars for reasons of both size and weight. I searched for an adjustable beam lamp where the lamp head is separate from the battery. The solution is the Rheohead from NLC products. 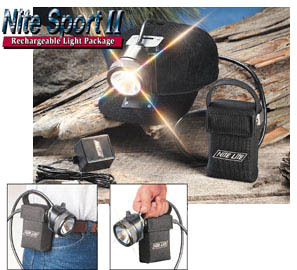 It is available with a battery, charger, lantern mount, and cap mount for $65 (Nite Sport II). 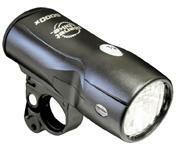 It is primarily intended for hunters, but it would make a good bicycle light as well. It uses a 4AH, 6V SLA battery. I believe that the headlamp is about 4 watts, not great but better than most dynamo lights. You'd have to figure out a mounting system for the headlamp on battery. You’ll pay big bucks for a decent handlebar mount light with integrated batteries. There were two available, the Performance ViewPoint Lazer, $70, 6 watts, NiMH batteries, and the Specialized Astro 5.0, $50, 5 watts, NiMH batteries. Both have now been discontinued, but I'll leave them in for a while. The Planet Bike 3.5W model is now the best you'll find for this type of light.. Planet Bike 5000X $18 3.5W Xenon. The rechargeable version has been discontinued, but of course you can still use your own rechargeable batteries. See http://store.yahoo.com/phattire1/headlights.html Specialized Astro 5.0 Performance Viewpoint Lazer. While there are numerous smart chargers available for AA and AAA cells, there is a dearth of smart chargers for C & D cells. C & D cells are finally coming down in price, and low-discharge C & D cells are also now available. I was looking for a good C & D charger because I use a lot of C batteries in Cree LED flashlights (the awesome Taskforce 2C Cree LED flashlight from Lowe's) for bicycle lighting. I finally saw what I was looking for in the Tenergy T6278 (specifications). There are individual charging channels with the LCD display for each channel. There's a fan to keep the batteries cool during charging, which also helps to prevent false over-temperature detection which would prematurely shut the charger down. The charge current is 1000 mA for AA, C, & D, 500 mA for AAA, and 13 mA for 9V, with trickle charge current of 100 mA for AA, C, & D, 50 mA for AAA. While the batteries are charging, the LCD display shows the bars moving up. When the batteries are discharging, it shows them moving down, then when the battery is fully-discharged it begins charging it (some channels can still be discharging while others are charging). At conclusion of charging, the LED for each channel changes from red to green, and the charger switches to trickle charge at 100mA (trickle charging above 0.05C (1/20th of the battery capacity is not recommended, so don't use NiMH batteries under 2000 mAH). The LCD will also indicate if the battery is bad. There is a discharge feature since periodic deep discharge is crucial in maintaining NiMH batteries (all batteries must be discharged at once, you can't discharge individual cells because there is only one button to start the discharge process. It takes a long time to discharge the 5000 mAH C cells, at least 20 hours. I checked the discharge current and it was 200 mA (I was timing it but was interrupted by a power failure). The power adapter is rated at 12 volts, 1.2A, so the charger could easily be used from a vehicle's 12 volt power source without the need for an inverter, but there is no DC charging cord offered so I'm going to fabricate one. The resellers of this charger should really offer a 12 volt cord with a cigarette lighter plug. One potential problem is that the charger stops automatically after six hours of charging (most good chargers will time-out just in case the Delta V charge detection or the over temperature detection doesn't stop charging). A fully discharged 10,000 mAH D cell will take about 14 hours to charge (extrapolating from the charging timetable (2.8 hours for a 2000 mAH cell)). Even the 5000 mAH C cells that I bought would take about 7 hours to charge from a totally discharged level. The next design should either extend the maximum time, or include a switch to select 6, 12, 18, or 14 hour cut-off. The instruction manual is printed on three sides of the box (in English and German) which is kind of a pain to not have them on a sheet of paper. It also charges 9V NiMH batteries (usually 8.4V in practice), but it doesn't do the discharge function for them. I'm not sure if the end of charge detection is ∆V or -∆V. Normally there would be a switch for Ni-Cad (-∆V) versus NiMH (∆V) to switch the end-of-charge voltage detection. The box just mentions "∆V control." All in all, it's the best C/D charger I've found, and I've looked at a lot of chargers. Of course it also charges AA and AAA cells, as well as 9V batteries. I ordered this charger from one of AllBattery's eBay "Buy it Now" auctions (where the prices can be less than their web site, though with higher shipping). Since they are close by to me, and I go over to that area often, I called to see if I could do Will-Call and they said it was fine, though they still charged $4 "handling" for me to pick it up. I got the bundle with 8 5000 mAH C cells for $60, including handling, plus tax. Note that if you navigate away from their web site without ordering you'll often get an offer for a 10% discount via chatting with someone (or something). This still was more than the eBay price for what I ordered so I declined. Two promotional codes to try at AllBattery are tenergy2008 (free shipping) and battery12 (12% off). These devices that lets you retrofit almost any flashlight with a 1 watt Luxeon LED (or two). They are quite expensive, but they should never require replacement. For 3 watt replacement LEDs it's much more difficult because these require very good heat sinking. One advantage of these devices is that you keep the spot/flood capability of flashlights such as the Mag-Lites. Flashlights that ship with Luxeon 1W LEDs usually have optics optimized for the device, and do not have spot/flood capability.